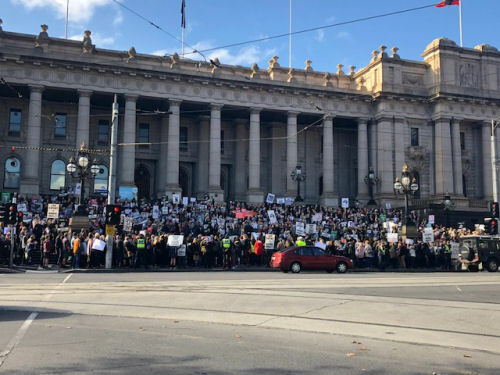 My feeling was that this industry represents a standard of treatment of other creatures that is so low that even though they are not physically hurt by it themselves , people will just not put up with it. If it were not for the "whistle blowers" recording the awful suffering of sheep and cattle on the ships and at their destination we would be unaware. They have brought it into our living rooms where it cannot be ignored or denied. 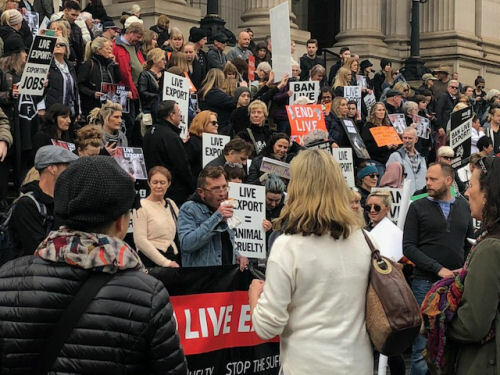 Another person who attended this protest summed it up as "Live Export is like mass immigration - it is another thing that Australians do not want, but which is foisted upon us by our governments." Another sign that we are not really a democracy. Yes, this is like our mass immigration policy! The public have no choice, no input and no way to address these political decisions. They are all for the benefit of filthy lucre, the big Dollar and big business. What's "good for the economy" needs to be agreed upon as being beneficial for humans, animals and how we live in the future. How many more demonstrations, petitions, rallies, and exposes are needed for politicians to get off their seats of power and act humanely? Where's there moral compass, their empathy and common sense? We should not have to go to all these extremes for what's common decency and obvious.